Yesterday, most of the auto industry joined together during a very official public hearing to slam President Donald Trump’s proposed 25 percent tariff on all imported cars and auto parts. But Trump’s team also heard from the general public—more than 2,300 comments in all—and, man, some of these remarks are sublime. 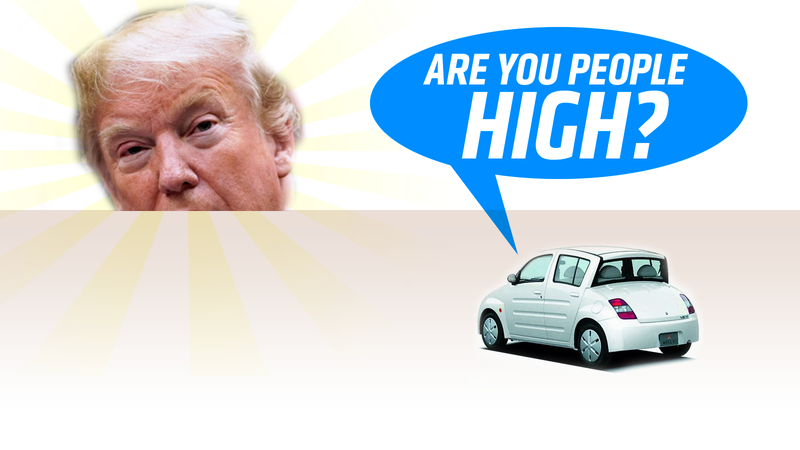 We’ve been hollering for weeks now about how a 25 percent tariff could inhibit the car buying public’s ability to love the cars. But let’s put aside the fact that, if the tariff is enacted, it could ruin nice things like PSA Peugeot-Citroën’s plan to return to the U.S., and let’s just hear it straight from the layman. THIS IS TOTALLY RIDICULOUS. THESE ARE USED ITEMS. Are you people high? How do imported cars and parts affect national security? Taxing cars is bad enough when you think how much money it generates, but to levy tariffs of 25% is absolutely insane. It’s time to come to a consensus about tariffs in general and how badly they will impact everyone here in the USA. Enough is enough! Taxes are inherently good, but I dig Erik’s outrage. The tariff imposed for used parts and cars is ridiculous. Those of us in the collector car hobby will be unable to buy parts or cars from foreign sellers without paying a 10X current amount of tariff, if my understanding of the bill is correct. Please eliminate the provisions as they relate to used automobiles or parts. When I was a child some 40 years ago, my Dad thought that working on old sports cars together would be a nice father son bonding activity. It was. I developed a passion for the small European cars that we worked on and the ones that we gazed upon with wishful eyes. One car in particular that he bought was a 1966 Lotus Elan Coupe that had been modified by the previous owner for sports car racing. He bought the car with the intention to put the car back on the road and drive it on nice days to his job as an engineer at a McDonnell Douglas. As a high school student, I asked him not to sell the car to anyone until I had a chance to own it. Five years ago he still owned the car and I was finally able to find a place for it in my home garage. It was now my opportunity to work on the car again and bring it back to the road again. I have very much enjoy working on my old English sports car and look forward to being able to drive it once again. Being over fifty years old, the vast majority of the parts on the car have deteriorated to the point of needing to be replaced. These parts are only available from manufacturers in England. Of course there are retail dealers in the United States that sell them, or I can purchase them from suppliers in England. Either way, the parts are not something that any American company is making, or would be interested in making do to the overall small number of people in the USA who want them. If the government decides to implement a tariff or tax on imported automobile parts of up to 25%, I don’t believe that I will be able to complete my project. There will be one more disassembled car laying around or worse, being sent to the crusher because parts are no longer available and know one is interested in old cars. I’m just one, of a great number of individuals with a passion for the car hobby. Some of us want to relive our youth by getting to drive the cars we lusted after. Others want to be able to share there knowledge of vintage automobiles with future generations. Please consider the individual car owners who are working to extend the life of there family heirlooms for future generations. These tariffs applied to collector cars and parts is a totally stupid idea. This is one of the most ridiculous things I’ve ever heard. “Import” cars are made in the United States. Every car has “imported” parts. If you’d like to crash the global economy, this would be a fantastic way to do it. Stop this protectionist idiocy at once! Perhaps try having an actual adult economist make trade policy instead of a petulant child. This absurd and incredibly short sighted proposal will do great harm to the vast number of American workers who rely on the sale and repair of imported automobiles. Moreover, it is a tax on American consumers which they will be forced to pay when they require service on their existing imported cars, or when they go shopping for a new vehicle. It is impossible to overstate how stupid this proposed tariff is. The Commerce Department has until February to report its conclusions to Trump on its national security investigation into auto imports. Have fun enjoying the wait until then.